Tuareg rockers Terakaft have been touring Europe for the past month. They played in Paris at the much-hyped Fête de la Musique on 21 June. Imagine a story that began a few centuries ago. Imagine a time when Timbuktu was so busy that it would make New York City blush. Imagine an age when the Sahara was a place of international exchange, way before the rise of modern globalisation. Trans-Saharan trade flourished. Caravans abounded throughout the desert, carrying salt, gold or dates. The Tuareg people regulated all that. This was also a time when inter-communal parties took place among Tuareg tribes. They gathered and celebrated while playing music. Terakaft (caravan in Tamasheq language) follows this tradition. The band has switched classic tindé drums in favour of sharp guitars. 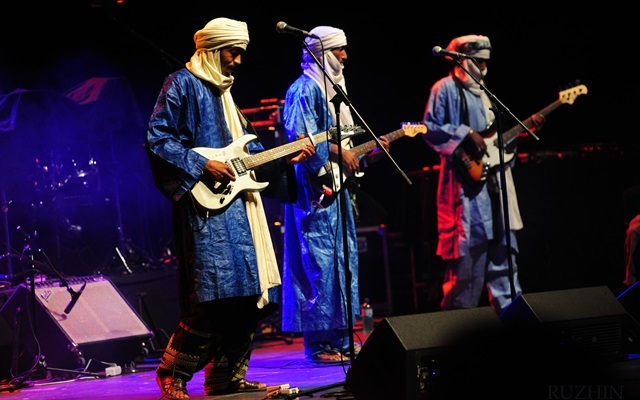 This is their way of reviving older Tuareg music and poetry. They call it assuf (nostalgia, solitude). The West names it blues. No point fitting it into a box. Only the music spirit matters. Terakaft released earlier this year their fourth album, simply named Kel Tamasheq (the Tuareg people). It’s packed full with great anthems. Any fan should be curious and excited to hear what the band would do with them in a live context. The first songs made clear that it would be an upbeat and lively kind of performance. Traditional percussions and clapping vanished from the rhythm section but the syncopated guitars and the live drums did the job nicely. The drums have actually been the main novelty of this tour. I had legitimate doubts before the show but drummer Nicolas Grupp, former Ibrahim Djo Experience member, naturally fitted in the music universe of the band. As far as the set list is concerned, they played a broad range of songs. Some from their earlier repertoire (Arghane Manine), some from the latest one (Allah Fal Manin), some energetic tracks (Idiya Idohena) and some quiet ones (Allah Fal Manin). The intensity on stage slowly built up as the show went. So did the audience’s spirit. Few in the audience were aware of this message or the tormented personal history of the band, but in spite of this drastically different context, the music spoke for itself. Tonight, it surely gained a few more followers. Next step: Glastonbury.